NOTE: The CDC will hold a COCA Call: November 13 – Acute Flaccid Myelitis (AFM): What Health Care Providers Need to Know at 2pm EST a week from tomorrow. For the third week running (see here, here, and here), the CDC has updated their AFM Surveillance page this afternoon. Since last week the number of confirmed cases has jumped by 8 (n=80) and the number of states affected increased by 1 to 25. These 80 confirmed cases are among 219 patients under investigation (PUIs), which is an increase of 28 over last week's update. Acute flaccid myelitis (AFM) is a rare illness that affects a person’s nervous system - specifically the spinal cord - and while rare, most cases occur in children. AFM falls under a broader `umbrella' of syndromes called Acute Flaccid paralysis (AFP). AFM remains exceedingly rare, striking fewer than 1 person in a million each year, but of those who are affected, 90% are under the age of 18. From August 2014 through October 2018, CDC has received information on a total of 404 confirmed cases of AFM across the US; most of the cases have occurred in children. 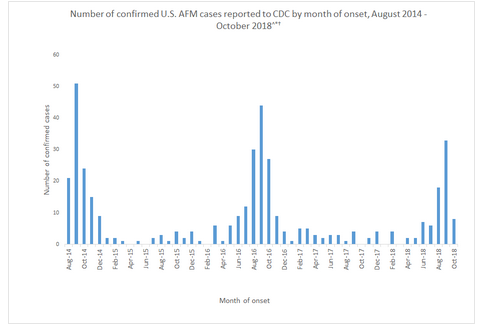 The graph shows the number of AFM cases confirmed by CDC as of November 2, 2018, with onset of the condition through October 31, 2018. Note: These 80 confirmed cases are among the total of 219 reports that CDC received of patients under investigation (PUIs). 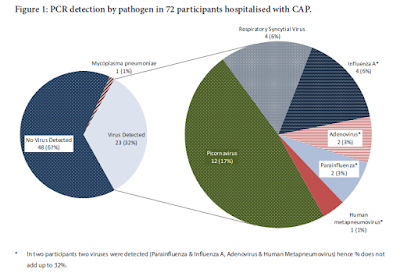 CDC recently received increased reports for PUIs with onset of symptoms in August, September, and October. CDC and state and local health departments are still investigating some of these PUIs. With enhanced efforts working with local and state health departments and hospitals, we were able to gather information on PUIs and confirm a number of these cases faster. 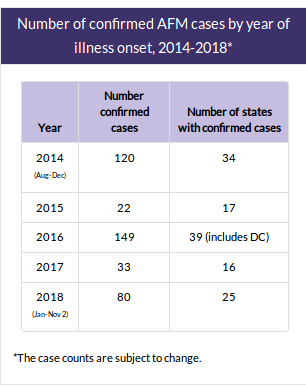 CDC is now providing the number of patients still under investigation so people can better anticipate increases in confirmed cases over the coming months. In case you missed missed it, 2 weeks ago the CDC held a Conference Call On Recent Acute Flaccid Myelitis Reports. You'll find the audio recording and transcript at this link. As paralysis often only appears days or even weeks after a suspected viral infection, positive lab results are often unobtainable. If you suspect you or your child is suffering from unexplained muscle weakness or paralysis, it is important to seek medical care immediately. The CDC continues to investigate, but until more is known, the CDC can only offer the following advice. While we don’t know if it is effective in preventing AFM, washing your hands often with soap and water is one of the best ways to avoid getting sick and spreading germs to other people. Learn about when and how to wash your hands. For more information on what CDC is doing, see our AFM Investigation page.